Some companies have excellent talent management processes. They have regular, fair appraisals, competency frameworks and encourage career progression through mentoring, secondments and networking events. However, the majority of employees aren't that lucky. They have to attend to their own career development if they want to 'get on'. One company which recognised this problem was Babcock - at the time, known as Alstec. They had an ageing workforce with decades of technical knowledge locked up in engineers' heads. There was no plan to capture that knowledge before these people retired, so the normal routine was for someone to retire on a Friday and come back as a contractor the following Monday - paid more, and with no incentive to do much of anything other than protect their knowledge, because that was what they were being paid for. Once someone reached this position, it was practically impossible to 'download' their knowledge, because that would make them expendable. The solution I put in place was a career management coaching program for 25 nominated 'high potential' engineers and project managers. Whilst the selection process was in itself flawed as it was the same subjective selection process used for internal recruitment, at least it was a start in the right direction. Over the next 2 years, those 25 participants received 9 coaching sessions and attended 5 group sessions. The program achieved an 83% success rate, measured by the participants achieving significant promotions or relocations which they would not have achieved by doing what they had done before - sitting back and waiting to be told what their next job would be. Two of the participants, as a result of the program, decided that they didn't actually want career progression, so of the participants who actually wanted to 'get on', we had a 100% success rate. The application of modelling high performers came in the design of the coaching process itself. Coaching is all well and good, but it relies on the coachee to provide direction, to set goals. The participants in this program didn't have a direction in mind, they were happy doing what they were doing. We needed a structure for the coaching sessions which would naturally lead to career development, by guiding the participants into a sequence of activities designed to maximise their career development opportunities. I looked at the behaviours of people who are naturally good at driving forwards their own careers, talking both to recruiters and to people who achieved promotions in other corporate environments. 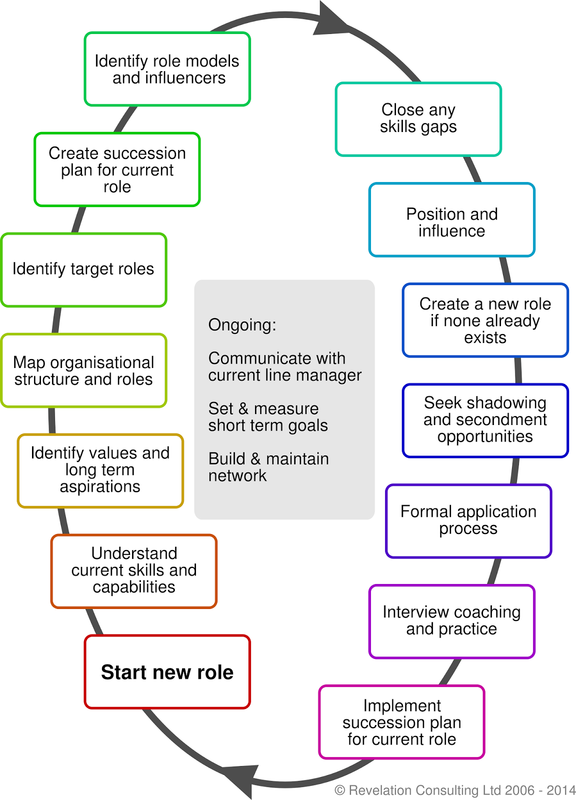 The end result was a 'career cycle' which we mapped each program participant onto. By shaping the focus of the coaching sessions around the cycle, each participant moved forwards simply by setting their own short term goals. Normally, these people would spend no time at all thinking about where they wanted to take their careers. The program forced them to take at least some time out to reflect on this, and to do so in a carefully structured way that focused their thoughts and plans on the activities which would logically move them forwards most quickly. The result was that Babcock had a more focused group of engineers and managers, now positioned to absorb that tacit knowledge and protect the integrity of the business for many years to come, while also enjoying greater responsibilities and rewards for themselves.